Hope's Cafe: SGSG-Gold Canyon Review and Giveaway!! I was so excited to bring back one of last year's sponsor's for the Spectacular Gift Shopping Guide-Gold Canyon! My experience with this awesome candle and home fragrance company has been nothing but great! And any item from their catalog would be the perfect gift for any woman or girl-even my 10 year old sister loves their products. 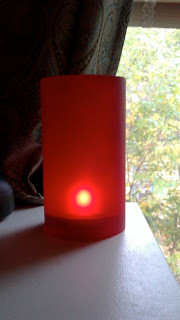 For my review, I received the Ruby Chimney Set, Black Scentmate, Holiday Wreath Fragrance Oil and Cozy Christmas Tealights. I have heard a lot about the Scentmates, but was unprepared for just how nice this really is! The Scentmate is basically a little fragrance machine! You apply a Gold Canyon fragrance oil to the scent pad, insert and then hit the power button. You are immediately enveloped in a beautiful fragrance! Powered by 2 AA batteries, this packs a powerful scented "punch". I could not believe how quickly it filled not only my bedroom, but the surrounding rooms as well! The Holiday Wreath Fragrance Oil is a very Christmas-y scent that really makes it feel like the holiday season! 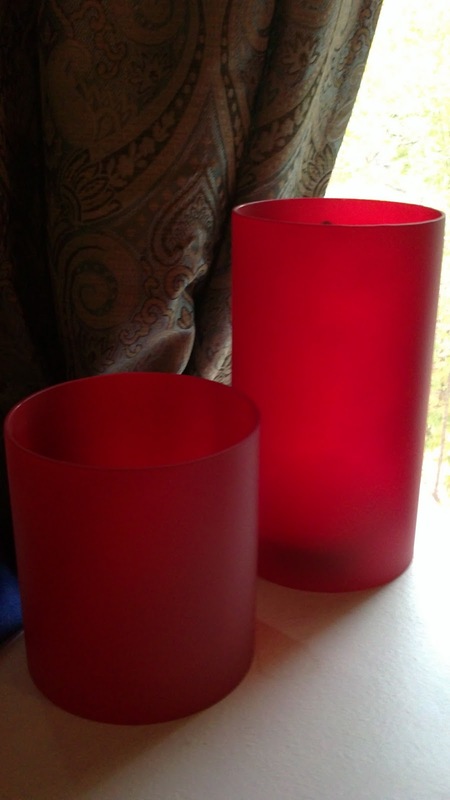 The Ruby Chimney set, although it is just a solid ruby color, also makes it seem like Christmas. Especially with the candlelight flickering-so beautiful! 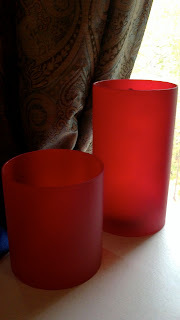 These look great on my dresser, or would be perfect for a holiday table centerpiece. 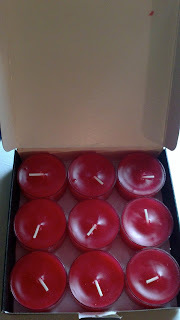 And using them with Cozy Christmas tealights...mmm! "Gold Canyon is a party-plan candle business with more than 26,000 Independent Fragrance Consultants across North America. At Gold Canyon we offer a complete line of candles, bath and body products and home products including home fragrance in the form of scented candles, room sprays and sachets; home décor with various candle holders; a full line of body care essentials and candle care products such as wick dippers and trimmers and wickless home fragrance. Our line of natural cleaning products is also an integral part of our business. Gold Canyon takes great care to meet the highest quality standards that we established right from the beginning. We started as a candle business and have grown to include a wide range of other home products that offer an enriched life experience. That’s why we’re “The World’s Finest”®!." 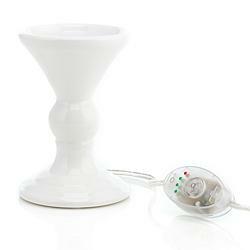 One of my readers will win the White Candlestick Scent Pod Warmer and Fall Scent pod Bundle!! I like the Revolution Scent Pod Warmer. I like many of the things!!! One in particular is the Frosted Hollyberry Specialty scented candle. The Boutique Chic Scented Candle. Besides the candles, I'd like the Emerge therapy foot creme. I would want a Sugared Vanilla Bean Candle. I'd love to have the Candy Cane or Candy Corn candles! I would be thrilled to get the No More Sniffles Essentially Soy Aromatherapy™ Scented Candle as a gift! Love it!!! Would be great for sinus headaches! I would like to get the Harmony Linen Scent Spray. I would love the Jingle Berry scented candle. I think the Candy Cane Scented Candle sounds delicious!! Please enter me. Thanks! I would love to receive their Scrolling Luminary Oil Warmer. Ohhh the Sugared Vanilla Bean Candle! Yum! I like the Woodland Spice Specialty Scented Candle and would like to recieve it as a gift. I would love to receive the Cozy Cabin Heritage candle! Sounds amazing! I'd love to receive the EMERGE Out on a Limb Body Lotion! I'd love to get the Holiday Wreath Specialty Scented Candle, the applique is so cute! The Bella candle is pretty. I'd like to receive a Changing Seasons Lantern Candle Holder. Thanks!